, thank you for preregistering for Clear the Shelter! You will receive an email shortly containing details needed on the day to fast track your adoption process, including a unique identification number. Please note that preregistration does not guarantee adoption but if you do adopt on the day, your details will already be in our system, maximising valuable time spent with your new pet! Does preregistering for this event guarantee adoption? No. It does not guarantee an adoption during this period. All normal adoption procedures apply and preregistration does not enable anyone to ‘skip the queue’ but it will save you some time on the day. To learn more about your local shelter’s adoption process, please contact them directly. Why are the animals being adopted at a discount rate? Many RSPCA NSW shelters, Care Centres and NSW Petbarn Adoption centres are filling up with wonderful, adoptable cats, dogs, guinea pigs, horses, rabbits… and many more incredible animals. On average 100 animals enter our care every day. A few of the animals in RSPCA NSW’s care have been waiting for their new families for more than 100 days. Offering a discount is a great incentive to bring more adopters into RSPCA NSW’s facilities to meet our fantastic residents. We know that buy offering discounts we encourage people to give a loving home to one of our amazing animals. Normal adoption procedures apply, so even though the adoption fee is discounted, the same time and effort goes into matching each animal to the right family. If RSPCA NSW is offering the animals at a discount, how do you know they are going to the right home? What is the adoptions process? RSPCA NSW always wants to ensure an animal goes to its perfect forever home. Therefore, normal adoption procedures apply even when a reduced fee is offered. Our animals’ wellbeing is always our top priority and will be monitored closely throughout the weekend. Once an interested adopter has expressed interest in an animal, RSPCA NSW staff will begin by ensuring the animal is the right match for the potential new home. For example, a dog who prefers a quiet, mature household may not be well-suited to a home with young children. An animal attendant will then provide the interested adopter with details about the animal, including the services or treatments the animal has received e.g., desexing, microchipping and parasite control. They will also discuss the animal’s diet, and any medications or regular treatments the animal may require e.g., flea and intestinal worming treatments, and vaccinations, including the dates when these are due. Each new owner will go home with an animal health check card. This will include important, individual information about the animal, including the date when the animal received parasite control and vaccinations. If relevant, the card will also tell the owner when the animal will need to undergo desexing stitch removal, or if ongoing parasite preventatives or vaccinations are required. Following the adoption, RSPCA NSW is also able to provide over-the-phone support if the new owner has a question or concern. Are the animals desexed and veterinary checked? All cats, dogs, rabbits and male guinea pigs adopted through RSPCA NSW come desexed and microchipped. All animals adopted from RSPCA NSW are vaccinated, up to date on worming and checked by a veterinarian. Desexing and identification requirements vary for each species available for adoption. 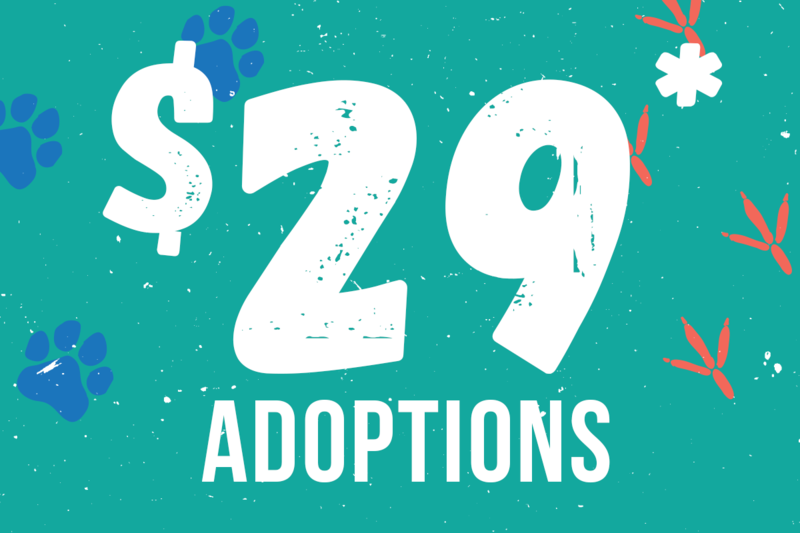 Animals are $29 to adopt during this period. Animals which have a standard adoption fee that is less than $29 will be free. Animals that are normally $29 or less include rabbits, mice, small birds, ferrets, poultry, rats and guinea pigs. Some animals may need to be registered with your local council at the time of adoption. Registration is a one-off, lifetime payment. I can’t adopt between 22 and 24 February 2019. Can I put an animal on hold and adopt it later at the discounted rate? The discounted adoption rate is available from 22 to 24 February 2019 only and there are no rainchecks. RSPCA NSW cannot put a hold on our animals, as this could prevent them from going to their forever homes sooner. Unfortunately, we are unable to extend the discounted adoption price outside of the set dates. Last year, there were no animals left to adopt at my local shelter, will that happen again? We had an incredible result last year and over 700 animals were adopted at locations across New South Wales. New animals become available in our shelters each and every day so be sure to check back on our Adopt page here each day to see what animals are currently available. Please note that there is a 10 minute refresh period on our site. This means that just because an animal is listed as available for adoption, it does not mean they will still be available when you arrive. You can stay up to date by visiting our Facebook page here for the latest and greatest adoption numbers during the weekend. How can I see what animals are available for adoption on the day? You can view all of RSPCA NSW’s animals available for adoption here. This website refreshes every 10 minutes or so, so be sure to keep checking throughout the weekend! Where can I adopt an animal? This offer is valid at all RSCA NSW Shelters, Care Centres and NSW Petbarn Adoption centres. You can view a full list of our shelters here and learn more about our Care Centre Tuggerah here. Please note, this offer is not valid at RSPCA NSW Volunteer Branches. Be sure to bring along photo identification (drivers license, passport etc., your unique registration number (this has been emailed to you)! You will not be able to adopt on the day without adequate identification.